Well it’s been almost two weeks since I return from Holiday, and they have been eventful in both positive and negative ways. The most positive bit of news I have is that Lisa give birth to a little baby girl (6.2 pounds) called Katie on the first day of November. However I’m still waiting to see a picture of mother and child. The big negative news was the very sad news was the death of my uncle Peter from cancer, he will be very sadly missed by myself and a lot of people. Another bit of good news is that Conor has a part in school Christmas play. It’s a role with (seven) lines and some physical comedy. He is very excited by this, and I think he will make a good job of it, because he is a bit of drama queen. In less interesting news, I’ve given my desk a good tidy, just in time for it to display my latest induction into my Starscream collection. 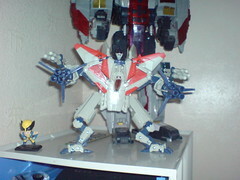 It’s the G1 coloured movie Starscream! It picked it up from ebay for a reasonable price. The new colour scheme and head make it look a lot better than the normal and more ape-like movie Starscream, it also seems that the legs have more articulation making it much more pose-able and fun. Finally this year the family and I celebrated Bomb fire night (the night in Britain when we celebrate the fiery execution of a catholic) by watching the Firework display at Stockton riverside. It was an very exciting twenty minute display. I enjoy a good catholic execution on a daily basis!